Violence and Injury Prevention Network: Positive Youth Development in ACTION! Positive Youth Development in ACTION! The PYD in Action Website is live! We are excited to introduce a new web based tool to help guide organizations in operationalizing the Positive Youth Development approach! 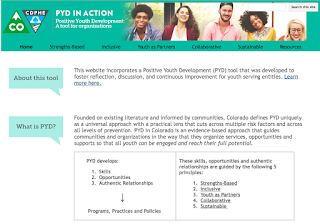 The “PYD in Action” tool was developed by Colorado community partners including young people. The tool is meant to foster reflection, discussion, and continuous improvement for youth serving entities. We hope to continue to grow this website and encourage you to engage in the content and add some of your own! Please share wide and far with those in your networks and organizations.